Badges are reproduced or faked for three main reasons: Profit, illegal access to the pits and demand for rare and/or expensive badges. Because badges from the 1930's and into the early part of the 1950's are rare and valuable there is the temptation for some to fake them for profit. Another reason is security is much tighter today than it was 30-35 years ago so a decent looking fake badge probably would’ve gotten you in. 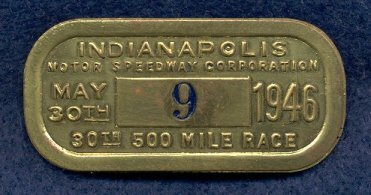 Lastly, because early badges, especially 1938-1946, are expensive and tough to find they’ve been reproduced to fill a void in the collector market. While it’s not cheap to make a good reproduction badge, they’re cheaper than the real badge. The most prolific year faked is 1950. To date, the numbers: 1 through 19 plus 21, 22, 23 and 410 have been accounted for with #410 being one of the more common numbers. There are also 1950 fake badges which have no number or are blank as seen below. The quickest way to tell originals from a fake is a lack of detail and “STERLING” is normally stamped on the back of fakes where as an original 1950 will have the Bastian Bros. marks/logo(s). Some fakes do have the Bastian Bros. marks/logo(s) or those that look similar to them but they lack detail, are blurred etc.. To our knowledge the Speedway has NEVER issued a Sterling pit badge. The pins and clasp on the back are usually NOT the heavy pin and clasp of an original as well. Fakes may look like a silver from the front at first glance, but when placed next to an original, the coloration is usually too bright and shiny and lacking in detail with the fakes appearing very worn with the lettering merging into the grill of the car. The #410 fake below might fool a novice collector as it looks enough like the real thing except for the lack of sharpness, merging of the lettering into the grill and on the back “STERLING” is stamped and the wrong pin and clasp are used. Note how the numbers on the original are precise, even and are heavily stamped into the badge. In contrast, the numbers on the fake #13 are not the correct type of number and not evenly stamped plus the lack of overall detail and sharpness. 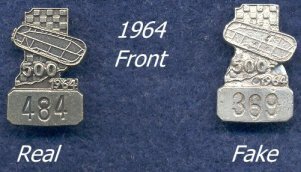 Other badges have been faked over the years as well such as the 1948, 1954 & 1955 shown below. While the front of the reproduction 1948 may show some of the detail of an original, it has an over all dull appearance in comparison. The back of the fake 1948 is heavily pitted, there is no indentation as on an original, there are no Bastian Brothers marks/logo(s) and there is no pin or clasp. The 1954 has a polished appearance and is bright compared to a real 1954. 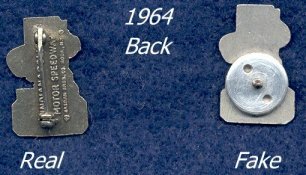 There are also modern day pin backs instead of the clasp and pin plus, there is a also a reproduction back up card. Note on the 1955 there are NO Bastian Bros. marks/logo(s), the pin and clasp are incorrect, paint is missing from the numbers and the badge in general shows pitting. The 1964 badge shown below probably would've fooled a pit guard as it's been done fairly well, but next to the real badge, the flaws are obvious. The 1988 bronze and silver fake badges below are fairy well made but next to originals, they are obvious fakes. Note there are no pins on the backs of either fake. 1938 through 1946 badges were reproduced a few years ago. They were all made fairly well but all are a bronze/copper type metal with no coloration to the numbers and have no pins to the back making them easy to tell apart from originals. A good rule of thumb for fakes and reproductions is that generally, fakes and reproductions lack detail and are poorly made. They're bound to be other fakes out there besides what's been shown here so if you have one or suspect you do, email NI500CC@NI500CC.COM and let us know and we’ll add it to the list of known fakes and reproductions. Back Up Cards have also been faked and reproduced. The thin cardboard ones from the 70's-80’s in the shape of Indiana are tough to tell. Printing quality is and was that good. A few of you may have fake or reproduction back up cards in your collection and not even know it. 1947 through 1970 back up cards have been reproduced but they are easy to tell from originals. They just aren’t made like an original and lack the sharpness and detail - note the #44 reproduction compared to the #3 original. Even the laminated type of back up card from 1988 through 2000 have been faked as well. Below are a fake and real 1991 back up card. The #262 is the fake - they're that good. Although it’s a bit hard to see, the #262 is a little fuzzy. So, in conclusion, fake and reproduction badges and back up cards (and memorabilia in general) are out there. Be aware and use common sense when dealing with expensive and rare items. Do some research and don’t be afraid to ask a fellow collector for help - it might just save you a lot of money.